The Listening section tests your ability to understand spoken English that is typical of interactions and academic speech on college campuses. During the test, you will listen to conversations and lectures and answer questions about them. This is the short format for the Listening section. On the short format, you will listen to two conversations and four lectures. After each listening passage, you will answer 5-6 questions about it. You will hear each conversation or lecture one time. You may take notes while you listen, but notes are not graded. You may use your notes to answer the questions. Choose the best answer for multiple-choice questions. Follow the directions on the page or on the screen for computer-assisted questions. Click on Next and then on OK to go on to the next question. You cannot return to previous questions. The Listening section is divided into sets. Each set includes one conversation and two lectures. You have 10 minutes to answer all of the questions for each set. You will have 20 minutes to answer all of the questions on the short format. A clock on the screen will show you how much time you have to complete your answers for the section. The clock does NOT count the time you are listening to the conversations and lectures. 2. What do semantic memory and episodic memory have in common? CD They are both included in short-term memory. CD They do not concentrate on each step in the process. CD They are subcategories of declarative memory. CD They are the two major types of long-term memory. 3. When the professor gives the example of riding a bicycle, what kind of memory is he referring to? CD She wants confirmation that the professor understands. CD She is worried that the professor may not be able to remember. CD She remembers something else that she needs to say. CD She disagrees with the professor’s example about vocabulary. 5. What does the professor suggest? CD He wants the woman to come back to his office again. CD He expects the woman to ask questions in writing. CD He offers to respond to additional questions by e-mail. CD He does not think that the woman will have more questions. 7. What does Gulliver learn about himself? CD He is like the Yahoos in many ways. CD He does not want to return to England. CD He wants to write about his experience. CD He is afraid of the Houyhnhnm. 8. In the discussion, the professor describes the characteristics of the Yahoos. Indicate whether each of the following is one of their characteristics. Click in the correct box for each sentence. B. They have a foul odor. C. They engage in an immoral lifestyle. D. They are satirical caricatures of humans. E. They live in trees. CD She is criticizing the author. CD She is asking the students a question. CD She is preparing to draw a conclusion. CD She is changing the subject. 10. According to the professor, what kind of book is Gulliver’s Travels? 11. What can we infer about the literature of the period? CD Satire was very popular. CD Most books were nonfiction. CD It copied the style of Swift. CD The tone was not very serious. 12. What is this discussion mainly about? 13. According to the professor, what are two problems that can be anticipated when roads are cut into an area for mining? B. The natural landscape is damaged. C. The roadbeds create waste piles. D. The ecosystem is disturbed. 15. What option is proposed as an alternative when all of the mineral resources in easily accessible locations have been depleted? 16. What does the professor imply about the environmental costs of mineral exploitation? CD He thinks that the environmental costs are less than the economic costs. CD He regrets that the environment is damaged during mineral exploitation. CD He opposes mineral exploitation when it is done close to urban areas. CD He believes in exploiting the resources in national parks and historic reserves. 17. What does the professor want the students to do in this class session? CD She does not want the man to be uncomfortable. CD She thinks that the responsibilities are too difficult. CD She is concerned that the man will be bored. CD She is worried that the man will not try to help her. 20. What experience does the man have that may be helpful? CD He knows how to operate the grading machine. CD He has answered the telephone in a law office. CD He has used computer programs for office work. CD He has been a work-study student in another office. 21. What is the pay for the work-study position? CD An hourly rate for sixteen hours per week regardless of the activity. CD An hourly rate for the time spent working but not for studying. CD A higher rate for working and a lower rate for studying. CD A weekly rate depending on the number of hours worked. 22. What can we assume about the meeting? CD The professor was impressed with the student. CD The student is not interested in the opportunity. CD The secretary will not need to interview the student. CD The work is very difficult to accomplish. 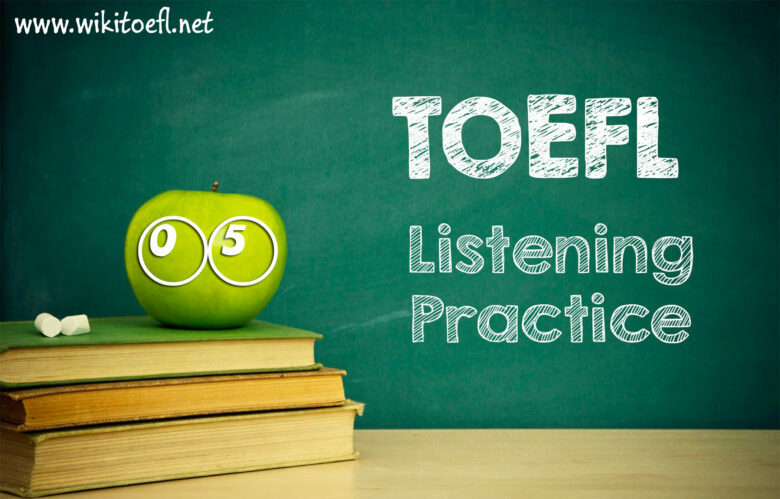 From where can we get the answers to TOEFL IBT Listening Practice Test 05 from Barron’s TOEFL iBT? You got 46/51. Keep up the good work!